Bibliophilia, Please: 2012 Fascination Award Nomination - and Giveaway! 2012 Fascination Award Nomination - and Giveaway! An article you wrote in 2012 titled Waiting on Wednesday (2) has earned your blog anomination for a Fascination Award: 2012's Most Fascinating Librarian blog. The comments posted in response to your post prove that your content not only inspires your audience, but it also creates discussion around your posts, both of which are requirements for the nomination of a Fascination award. As a nominee of this award, you have full permission to display the "Nominated" emblem on your website. To learn more about the contest, the rules, or the prizes, click here: 2012 Fascination Award Rules and Prizes. Accept your nomination by replying to this email by Thursday February 24th (11:59 PM EST). Voting begins February 27th at 12:01 AM (EST). The blog with the most votes by March 5th at 11:59 PM (EST) will win the grand prize, a $200 restaurant gift card. At first I was flattered, but then I realized that there wasn't very much of a discussion on that post that would merit such a nomination. I mean, you guys are great, but a five comment conversation doesn't seem like something that would put me in the running against some fantastic blogs. That caused me to do some research. Reading three blogs I found on Google (TYWKIWDBI and then to Quantum Progress and dy/dan) helped me decide that it would probably be in the best interest of my followers (I love you guys) and myself to respectfully decline this nomination. Even though I am taking myself out of the running, it does not mean that a celebration is not in order. Isn't it always said that it is an honor just to be nominated? Well, I think it's a load of malarkey in most cases. People want to win! Oh yeah, I think someone needs to win something after all of this nonsense. So, Leah gave me some Awesome of a Lifetime sweetness (it won't really be real until I see the book), and I want to give one of my US followers a copy of A Touch Morbid*. (Sorry International Awesome Squad, the next one includes you, I promise.) Time for some Rafflecopter fun! 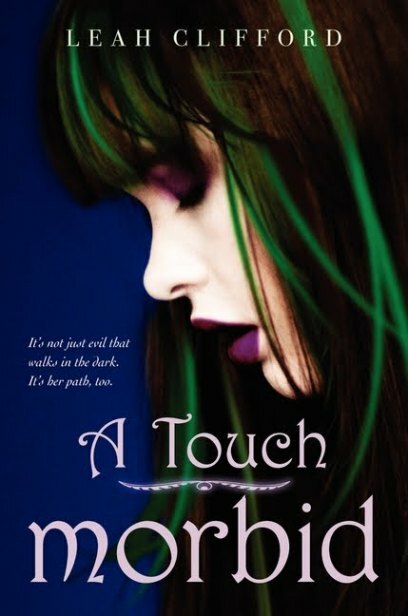 *Okay, if you haven't read the first book in the trilogy - A Touch Mortal - you can choose that as your prize instead! Seriously the award is nice and all but I'm just thinking of how you gave up a chance to win $200 worth of food away lol! Hello Kayla, thank you for letting me know more about what is behind the nomination. I have now written to the guy who sent me the email and asked for an explanation. It will be interesting to read what he has to say! And then I'll decide on what to do. I got an award like that and I had to give it to 7 other people. I just randomly looked at blogs til I found some that still accept blog awards. Good on you for researching the award! I would have assumed it was spam and ignored the email completely. I recently received an email that I honestly can't tell if it's legitimate or spam. The person wanted me to pay them to write articles for my blog. I'm still baffled. I review for fun, why would I pay someone to write for my blog. As a college student what they're doing completely enrages me though. It's disgusting. This does sound a little fishy. It just amazes me all the new ways they come up with to spam people. Thanks for the giveaway! Thank you for stopping by and entering! I thought it sounded fishy, too, and that's why I looked into it. My blog gets fair amount of traffic for its size, but nothing to put me on the awards radar. I've never heard of this, but if you think it doesn't sound right - go with your instincts. You're right about feeling good about getting nominated for something though! Thanks for the giveaway! I'm so glad you came by my blog and entered! Sounds fishy, but congratulations anyways! Hmmm....I'd be excited, but would do thorough digging. Go with your instincts. If it feels off or sounds to good to be true, it usually is. Thanks for the giveaway. I have this on my tbr list. It seems a little weird, but, hey, take approbation where you can get it, right? Do a little dance, have a little drink and read an awesome book to celebrate! I think take credit where you can get it! Awesome! You have a good point. Thanks for stopping by! Congrats for the nomination! And thanks for the giveaway. The nomination sounds fishy. I'm glad you researched it first then declined when you felt you didn't deserve it. Thanks for the giveaway! I have the first book on order now!